Giraffes, the tall, hoofed mammals that inhabit the grasslands and savannas of central and southern Africa, migrate in herds. Giraffes form into herds of 50 or fewer individuals of the same subspecies. Their migration patterns are affected by a number of social and survival-related factors. Though giraffes often travel in herds, they are very independent animals. Giraffes do not usually develop close connections with other members of the herd, with the exception of bonding between mother and calf. No single giraffe signals the rest of the herd to begin moving. 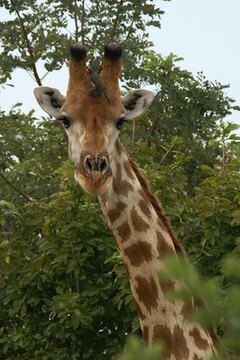 Female giraffes stay in close proximity to other females and young adult males, but there are few interactions of individuals within these groups. When female giraffes are preparing to give birth, they join small calving groups of fewer than 15 future mothers. The calving groups will stay together through the migration period, even if the herd migrates as the calving group prepares for birth. Calves almost always travel with their mothers during migration. Whether or not the herd is migrating, a mother may leave her baby with another member of her calving group so she can wander and seek better food sources. Lack of vegetation is the primary reason for giraffe migration. Giraffes are the world's tallest land mammals, and their long necks enable them to feed from trees that other animals cannot reach. However, after the herd has eaten all sufficient vegetation in a specific area, it must move on to another place where trees and shrubbery are plentiful. This occurs most frequently during dry periods. At times, herds become so desperate for vegetation they will migrate to an area that has few shrubs and grass patches. Predators such as lions and hyenas will seek opportunities to kill and eat calves and young adult giraffes during the migrations. Young giraffes walk closely with larger members of the herd to protect themselves. The spotted skin pattern of a giraffe can hide younger and weaker members of the herd in the midst of stronger giraffes during travel. Once the herd finds a new feeding location and individuals have separated from the larger group, older members will no longer attempt to protect the adolescents and young adults.